Ready rolled, butter enriched shortcrust pastry. 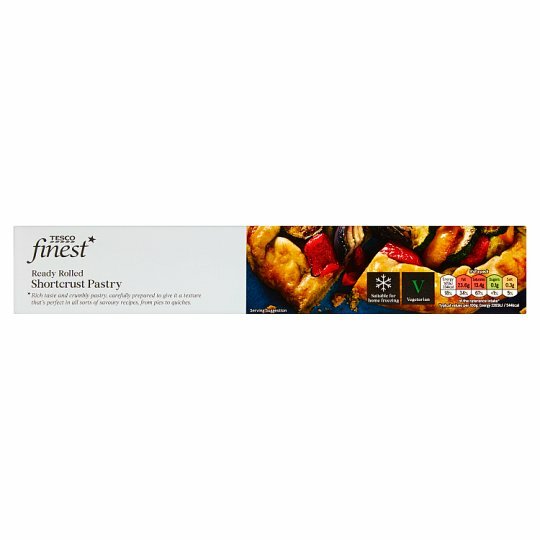 Rich taste and crumbly pastry, carefully prepared to give it a texture that's perfect in all sorts of savoury recipes, from pies to quiches. Wheat Flour (Wheat Flour, Calcium Carbonate, Iron, Niacin, Thiamin), Butter (Milk) (18%), Margarine, Water, Salt, Preservative (Potassium Sorbate). Margarine contains:Palm Oil, Rapeseed Oil, Water, Salt, Emulsifier (Mono- and Di-Glycerides of Fatty Acids), Acidity Regulator (Citric Acid). Instructions: 200°C/Fan 180°C/Gas 6 10-15 mins Remove from refrigerator 5 minutes before use. Unroll pastry, leave on baking sheet provided and cut to required size. Place on a baking tray in the centre of a preheated oven for 10-15 minutes or as stated in your recipe.